Make your hybrid cloud operational in under 3 hours with a pre-assembled, fully integrated hybrid cloud solution. With integrated, powerful, multi-cloud management you can match the right application to the right cloud, gain visibility into end-user activity, and manage the cloud applications that power your organization. 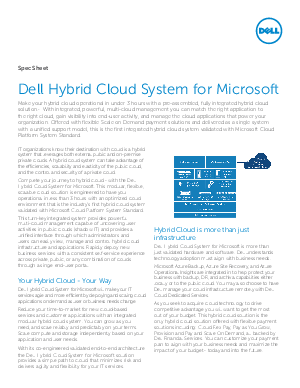 Offered with flexible Scale on Demand payment solutions and delivered as a single system with a unified support model, this is the first integrated hybrid cloud system validated with Microsoft Cloud Platform System Standard.